Victorian religion, science and superstition battle it out over a possible giant sea serpent off Essex. Cora, whose abusive husband has just died, sets out with her unusual young son Francis and working class activist friend Martha to investigate. Finally able to explore her own interests, this amateur naturalist wonders if the serpent might be a surviving relative of her heroine Mary Anning’s ichthyosaur. 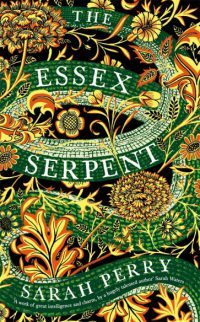 While in Essex, Cora meets Will, an Anglican priest, with whom she immediately connects – and with whom she immediately disagrees over the serpent. Will’s wife Stella welcomes Cora into her home, and becomes close to Francis (who I read as autistic, and whose effective portrayal here reminds me to “think smarter about people who think differently”, see https://theriversideway.wordpress.com/2015/11/03/neurotribes-the-legacy-of-autism-and-how-to-think-smarter-about-people-who-think-differently-by-steve-silberman/ ). Left behind in London, Luke, an innovative but impoverished surgeon, is in love with Cora and resentful of her new relationship with Will, while his wealthy friend Spencer considers philanthropy, in part as a possible way to get closer to Martha. The Essex Serpent is a fresh and gripping story about class, difference, attraction and most of all friendship. The epigraph from Montaigne is identical to that used by Rose Tremain in her recent The Gustav Sonata, another beautiful exploration of how friends are (https://theriversideway.wordpress.com/2016/06/29/the-gustav-sonata-by-rose-tremain/ ). This book will appeal to those who loved Sarah Waters’ Victorian novels, Michel Faber’s The Crimson Petal and the White, and the gothic elements to fans of Andrew Michael Hurley’s The Loney. Perfect holiday reading.